A weak GPU for the same price as a quality one thats set to disappear. Naughty AMD. I deliberately held back the review for this latest card from AMD so I could put it out alongside a review of the competing card from Nvidia, the GTX 650 Ti Boost . If I hadn't then this review would have simply been a lot of me crying over the loss of the HD 7850 1GB, which will no longer be manufactured to make way for the HD 7790. There will still be quite a lot of crying about the HD 7850, however. It was one of my favourite cards of this generation - it had the sort of gaming chops that belied its budget pricing and it still makes me feel gooey and nostalgic - in the same way I feel about the beautiful 8800GT and the GTX 460. Oh, those were the days. But the HD 7850 was probably quite expensive to produce thanks to the Pitcairn Pro chip, with its nigh three billion transistors and budget-busting 256-bit memory bus. The Bonnaire XT chip at the heart of the HD 7790, meanwhile, is very much a budget chip, without any of the top-end extras that came in the Pitcairn Pro-based card it is ostensibly replacing. "It posts mediocre benchmark figures - worse than the HD 7850 1GB for much the same price, even when overclocked." AMD have cut the memory bus in half, offering a miserly 128-bit bus and have created a much smaller GPU, with 800 million fewer transistors and a 160mm 2 die compared with the 212mm 2 chip of the HD 7850 1GB. This has a major impact on performance. Compared with the Pitcairn Pro chip, it posts pretty mediocre benchmark figures - worse than the HD 7850 1GB for much the same price, even when overclocked. 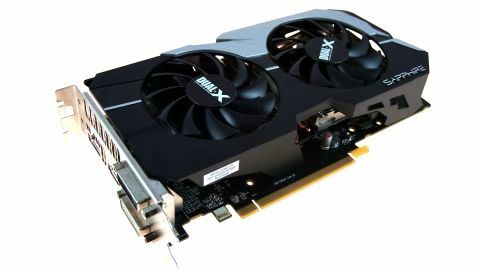 Things look grimmer still when you put AMD's card alongside Nvidia's efforts with the impressive GTX 650 Ti Boost. Nvidia has improved the silicon in pretty much every area it can and yet their card comes with the same pricetag as the original GTX 650 Ti. Now, that's how you do a refresh. Peculiarly, this is a total reversal of form: AMD have always been the ones to create great budget cards with impressive performance while Nvidia created expensive, worse-performing options in the volume segment. Things still look good for AMD in the other segments, with the HD 7970GHz Edition having the lead over the GTX 680, and the HD 7870 XT ruling the roost below it, but the GTX 650 Ti Boost could represent Nvidia making a price/performance comeback. Quite what AMD were trying to do with the HD 7790 - aside from just designing a cheaper chip - I really don't know. AMD have garnered a lot of goodwill over the last few releases, and I hope their weak showing with the HD 7790 doesn't represent future initiatives.